Winnebago Industries took its Class B Touring Coach segment to a new level for 2017. 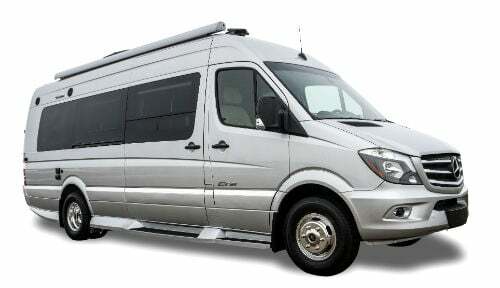 This time around RVers are offered the Winnebago Era 70M, which rides on a Sprinter chassis and features an exclusive slide out design, offering smooth riding comfort to a destination with added interior space to enjoy once you’re there. “The Winnebago Era 70M for 2017 and it’s the only coach that has a slide room in the North American RV market,” says Russ Garfin, product manager for Winnebago Industries. The Era is available in three floor plans. 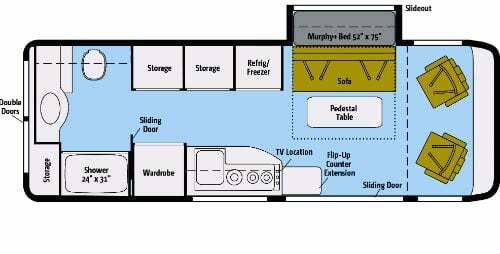 The Winnebago Era 70M is one of three floor plans in this series (that also includes the 70A and 70X) targeting young families, couples, or singles on the go. When it comes to size, the 70M has a length of 24 feet, three inches, a height of six feet, three inches, and interior width of five feet, 10 inches. While there are larger Class Bs on the market, few, if any, offer a slide out. It simply retracts to an exclusive sleeping space with its 52×75-inch Murphy bed. 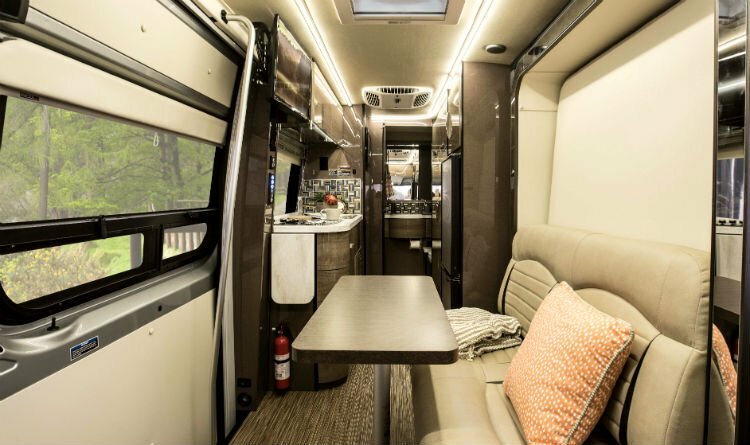 “The Winnebago Era 70M is the only class B coach that has a slide room in the North American RV market,” Russ Garfin, product manager for Winnebago Industries told RVlife.com. “We offered a slide out in a previous class B (the 170 C) but it had a different fold-out bed, cabinet designs and heating and cooling systems. We wanted to bring this Era up to date by adding the Murphy bed and new heating/cooling systems. Further, when it comes to heating or cooling, Winnebago opted to use the Hydronic heating system as well as a 13,500 BTU high-efficiency A/C unit with a heat strip. A galley featuring a flip-up counter extension, Corian countertops, and a back splash. There’s also a convection microwave and three-burner range featuring a glass top and stainless sink. The Winnebago Era was introduced at the 2016 RVIA National RV Show. It garnered much attention with its compact design, while improving living space with a large sofa and a pedestal table; UltraLeather swivel seats; storage space; and rear double doors. The 70M also tastefully appoints dark, seamless cabinetry, color schemes, and ample window light. Additionally, you’ll want to see the new Winnebago Class Bs for 2017 that also includes the Ford Transit-driven Paseo 48P, plus the Travato 59 G, and Travato 59K set on the Ram ProMaster Chassis. Fresh Water Tank: 44 gal. Gray Water Tank: 25 gal. Black Water Tank: 22 gal. Solo RVer looking to buy a class B soon. Can you unfold the Murphy Bed (or the sofa bed in the 70C) WITHOUT putting out the slide? I haven’t seen an answer to that. Obviously it would be a tight squeeze around the bed if you do, but I am curious if it can actually be done. Thanks! I am also interested in this class B but unfortunately not at this price. if you do the math, it appears that you can not unfold the murphy bed without using the slide. The purpose of the slide is to provide a large bed and it seems like a great design, just not worth the money to me.